Mango, “The king of the fruits” is one of the delicious tropical seasonal fruits. 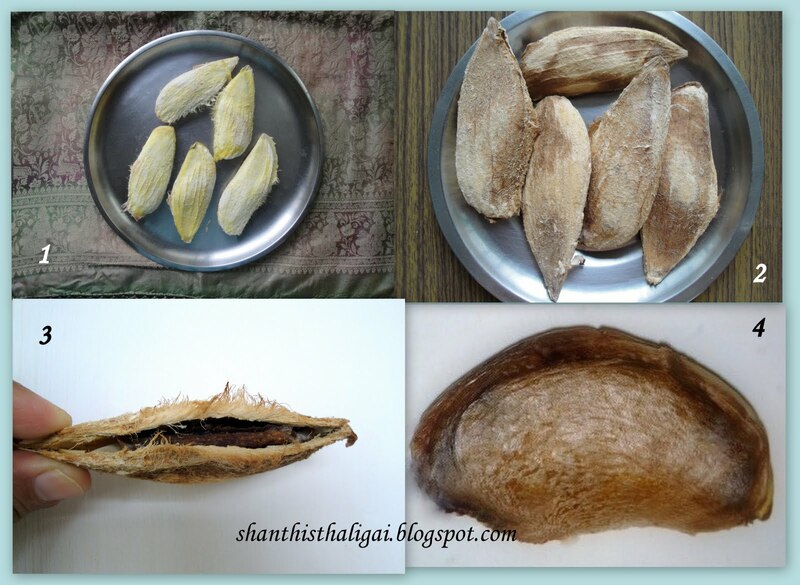 All of us know, the mango kernels are used in making dhal, thogayal and kozhambu. This is a post on "Patti vaidyam", grandma's natural remedy. Let me call it as a "Grandma's therapy" using the butter of the kernel. 1. Collect the seeds of fully ripe mango or fully grown raw mango during the mango season. The seeds of ripe mangoes are best. 2. Keep the seed in a shady, warm area to dry. It takes about a week for the seed to completely dry. The seeds will be hollow when you tap it and when you shake the seed you can hear the kernels shaking inside. In that stage, store it in containers. This can be stored for a year. 3. When needed, break open the hard shell and take out the kernels. 4. It is these kernels which have medicinal properties. Rub the kernels with 1/4 tsp. of water in a "chandana kal" ( the stone which we use to make sandal paste). Add water in drops and rub till you get a spoon of paste. This paste is called "the butter" and has immense medicinal properties. 1. The butter is used in curing diarrhoea,dysentery and stomach pain. 2. When taken during periods, it controls excessive bleeding and white discharge. 3. Mango butter taken with a spoon of honey is used as a home remedy for piles. 4. The butter is also used in aromatherapy for haircare and skincare. It is also used in cosmetic trade. for making hair conditioners, face creams, soap and lotions. very useful post.. thanks for sharing it..
Of course our grandmoms were great therapists....home remedies like these were always available for almost anything...atleast in the first aid stage. Greatly useful post Shanthi. hey this is very nice info. Nice info dear..never knew that mango kernels are so useful! hmmmmmmmmmmm I never knew Mambazha Kottai had such medicinal properties and thanks so much for sharing. Awesome information awesome!!!!!!! I really loved how you have given this useful tip from a seed that we usually throw away :) Never knew this!!! Thank you so much..Should we eat this butter to get rid of health problems?? Very nice info.I am from tbr too. Good one...we make curry with mango seeds in Rajasthan. Today i read that mango seed powder is also used to prepare ice cream . (PASUMAI VIKATAN).Instead of coco butter,mangoseed powder and oil are used.